Growing up, my dad was obsessed with cars. We always had at least four of them – ranging from Mercedez-Benz sedans to a DeLorean DMC-12 and various Ferrari convertibles – even though there were only two drivers in our household. The main chore my dad had for my sisters and me on the weekends was to wash, vacuum out and wax each vehicle. Instead of loving these classic automobiles, I was pretty much indifferent to them. That is, until I met Alex Manos. The owner and founder of Beverly Hills Car Club took me on a recent visit to one of his favorite places in Los Angeles, Petersen Automotive Museum, and his enthusiasm was infectious. We were in the lobby for just a few minutes to snap a photo in front of the museum's sign, and he can hardly stand still in anticipation of showing me all the cars. "As a kid I always grew up around classic cars. My parents had a Volvo 1800S, a two-door sports car, Aston Martin lookalike. It was really cool. They also had a Volvo Amazon," remembers Alex. "So, classic cars have always been a passion and something I've had a love for." The first model to come into view as we begging exploring the Petersen is a gorgeous 1963 Rolls-Royce Silver Cloud III, formerly owned by Emmy-winning director John Frankenheimer and his wife Evans, and Alex tells me about his previous visits to the museum. "One of my first times here was for a party being thrown by Snoop Dogg. I remember seeing the 1938 Alfa Romeo here and the 1949 XK120 Jaguar," he shares. And yes, he recognizes each car on sight and can immediately come up with the make, model and year in every instance. When I remark that he could spend an hour just looking at the details of all the cars, Alex corrects me, saying, "Much longer than an hour! If you are passionate about these automobiles, just staring at one is a relaxing thing. It's like staring at the ocean for some people, staring at these cars." One could really take an entire day to take in everything at the Petersen Automotive Museum. Their current exhibits include Sculpture in Motion: Masterpieces of Italian Design (running through Feb. 3) – in which Alex could be heard to exclaim, "What if you rolled up to a club in this car?!" – and Aerodynamics: From Art to Science (running through May 27) that showcased sleek and completely unique body designs, like the 1916 Miller Golden Submarine. The museum unveils a new exhibit, Fins, Flash, and Flying on Four Wheels on Feb. 23 with more than a dozen iconic vehicles with fins, including the 1959 Cadillac, 1937 Delage Aerosport and 1952 Spohn Palos. You don't have to be as avid a car lover as Alex to enjoy the museum, though. Some of their permanent exhibits, like Hot Wheels and Hollywood Gallery: Cars of Film and Television, appeal to everyone. Besides a Batmobile and Robin's Motorcycle, there's the 1965 Mercedes-Benz from The Hangover and, in honor of the new Gangster Squad film, the Petersen hosted an exhibit of costumes, props and vehicles driven by actors such as Emma Stone in the movie. Being approached by several celebrities who were intrigued by his ride is actually how Alex was struck with the idea of starting Beverly Hills Car Club. "About 12 years ago, I bought a 1962 Lincoln Continental with suicide doors. I bought the car from a guy who had owned it for 30 years and was the manager of the service department at a Lincoln dealership. So the car was perfect mechanically, and everywhere I drove it people would try to buy it from me. Shaquille O'Neal pulled me over. Hype Williams chased me down," he recalls. "After a while, I was like, 'You know what, I'm going to sell this car and get another one.' I sold that car, and it just started escalating from there." Alex's next car was a convertible that needed some work. "After I sold that first Lincoln, I started restoring cars. I bought a convertible, painted it and started getting into the restoration aspect of it. It really gives you a deeper love for the cars because you're doing so much work on them." Since he's always had a creative flair, it was easy for Alex to envision what the convertible would end up looking like, and he found a lot of joy in dreaming up the details, like what color combinations to use. Alex's uses this same keen eye to discern a car's ultimate potential when purchasing cars to sell through Beverly Hills Car Club, which he founded in 2008. "Our cars come through dealers, auctions and the Internet – a bit of everything. We have cars from $1,500 all the way up to over $200,000. We're probably the only place that's like that, where you can buy a car for $2,000 and then the next car down is $200,000. It gives everyone a chance to find their dream," he says. "The great thing about this company is that if you only have a small budget, you can still buy your dream car. You can build it up and put money into it slowly." Beverly Hills Car Club really do have something for car collectors from any walk of life. They basically buy and sell each model as-is. Most of their inventory is comprised of European cars, but they do buy and sell Ford Mustangs and Thunderbirds as well as Chevy Corvettes. Right now they have a 1965 Mercedes-Benz 220SE Coupe, like the one in The Hangover that's at the Petersen, for just $1,250. Since it needs a lot of restoration work, it's the perfect starter car. They have a 1973 Porsche 911T Targa in good condition for $26,500 and a pristine 1938 Peugeot 402BL Eclipse Decapotable for $189,500. 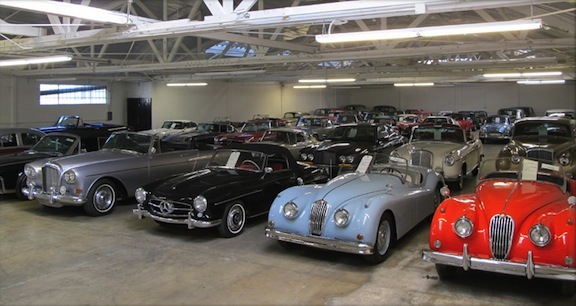 You can visit their showroom in East Los Angeles (4576 1/2 Worth St.), where they have two warehouses with 50,000 square feet full of classic cars. The 1953 Nash-Healey on display at the Petersen elicits a funny story from Alex. "I had that car there, [points to] the Nash-Healey by Pinin Farina. It was a restoration project. A friend of mine from Coldplay was here at the museum, took a picture of this car and sent it to me because he had seen the one I had at the dealership. He said, 'I don't know if you know what you have!' I replied, 'Oh, I know what I have,'" Alex says with a laugh. Although the Ferrari 275 GTB is one of his favorite cars and he has a special affinity for Mercedes, Alex admits to falling in love every time a new vehicle is brought to their showroom. "Every time a car gets here, it almost feels like a rare, new find, and I get obsessed with that car until the next one comes." It's this passion that makes Alex's excitement so palpable whenever he talks about classic cars. It's his fervent dedication that fuels Beverly Hills Car Club to strive for the best and bring collectors the most rare automobiles imaginable. "We serve customers worldwide, so we have people asking for all different things. With these cars, no request is crazy. That 'want' everyone has who is in this business or has this as a hobby, to find that one rare car that nobody else has – there's just something about it. That's what I think makes us successful, that there is so much passion and love for the cars that it just drives you more. If someone has a job, and they're not happy with what they're doing, it shows. If you go to a restaurant and the chef hates his job, then the food doesn't taste good. If you go to a restaurant and they love what they're doing, then the food is delicious." Beverly Hills Car Club is located at 4576 1/2 Worth St., Los Angeles. For more information, visit beverlyhillscarclub.com. I think Alex is lucky that I found his ad for an auto mechanic & I emailed him to hire my brother, Francisco, the best, auto-diesel mechanic from the Philippines !!! & the best auto mechanic & an honest to goodness person indeed !!! I love your blog Yuri !!! Thanks !!! Nice, all are super car. So beautiful! I really love the 1965 Mercedes-Benz from The Hangover, and this club seems really interesting with various kind of car. Thanks for sharing this! Wow, I'm a classic cars lover, so this club is exactly what I need. Btw,I personally believe that 1949 XK120 Jaguar is the best! In an automobile, ball joints constitute important auto parts. Ball Joints are spherical bearings that connect the control arms to the steering knuckles. Ball joint consists of a bearing stud and socket enclosed in a casing. These parts are made of steel. The bearing stud is narrow and fits into a tapered hole in the steering knuckle. A protected encasing prevents dirt from getting into the joint assembly. mainly, this is a like rubber-boot that permits movement and expansion of lubricant in an automobile. So, it is advised to get good quality ball-joints for your car and change it when necessary. We have some important guide for this. Hi, I appreciate every bit of your efforts to let us know about Beverly Hills Car Club. In fact, we’re going to study and research it as part of a half-yearly initiative supported by our website Sandersreview. and group of partners.